Conventional bulk storage racks are the ideal solution for warehouses needed to store palletized products with a wide variety of skus. Conventional bulk storage racks make it easy to control stock by allowing each pallet and SKU to be accessed directly. These pallet racks can be adapted to any size, weight, or volume of merchandise. Easy Rack can also have custom, double-depth bulk storage racks constructed that will allow pallets to be placed one in front of the other on each side of the aisle. 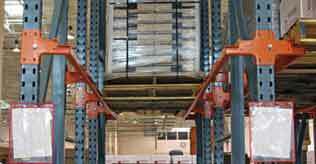 Live bulk storage racking is fitted with a slightly gravity-inclined flow rack. This flow rack enables pallets to slide down the other side of the deck at a controlled pace. This is a major time and space saver when in business that sees a high volume of pallet handling. The compact storage system allows for maximum capacity, and the efficiency of this type of bulk storage racks facilitates perfect pallet turnover (FIFO SYSTEM). Live bulk storage racks are a favored storage solution for food service industries and any industry dealing with perishable materials. Drive-in racking works exceptionally well for businesses who have high numbers of pallets per article type combined with low levels of turnover for homogeneous products. In terms of area and height, a drive-in bulk storage rack offers the best use of available space—up to 85%! 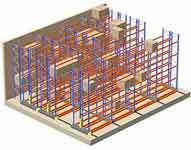 It eliminates aisles between racking and will accommodate as many article types as there are loading aisles. Easy Rack can build these systems with two types of rigorous entrance and exit control. One system features one access aisle only, and the other allows access from both sides of the rack. Cold storage facilities often prefer this form of pallet racking because of its ability to provide maximum storage space in climate controlled environments. These racking systems are also ideal for space saving in high storage density warehousing environments. Time management is also facilitated by making it easy to load and unload these racks from a central aisle. Pallets are placed along trolleys that are conveyed by rolling rails that are slightly inclined. When a pallet is removed, the pallets move forward from the back to fill the space. 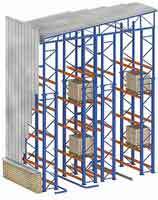 Mobile Bulk Storage Pallet Racking. This type of pallet rack racking is built on a guided mobile base. Warehouses use this type of storage system when they need to reduce the number of aisles and increasing warehouse capacity without losing direct access to individual pallets. Ever base is motorized and equipped with electronic mobility and safety features. This is often the best type of rack to use in cold storage areas where every bit of space counts, and where it is not necessary to have individual access aisles. Easy Rack can build these systems to operate manually or electronically via computer control. 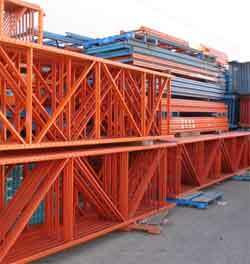 Clad-Rack Bulk Storage Warehouse Pallet Racking. These are the giants of the pallet racking world. They are built prior to construction and are made to combine with the sides and roof cladding of the new warehouse to form part of the structure itself. The only limit to the maximum height of these storage racks is the limit set by local standards and the reach of stacker cranes and fork trucks. Systems that are as high as 30meters are not uncommon. Clad-rack bulk storage systems can be custom-built from conventional rack or drive-in racking designs. Their main advantages are they are highly customizable and use all available storage space in an area without the prerequisite of an existing building.